April has been a pretty cold month for us in the northeast. It seems like it’s unseasonably cold, with just a few really nice days so far. Plants are pushing up through the ground even though we had a few inches of snow about a week ago. 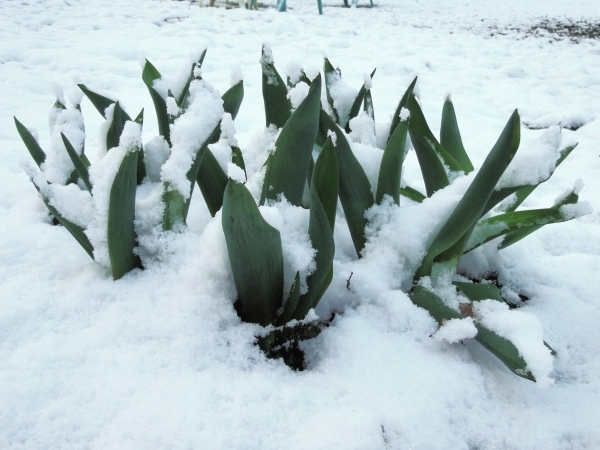 I got this photo of my tulips that were growing nicely when they suddenly had to endure a coating of the white stuff. The heavy snow in this late snowfall clung to the trees and made for some opportunities for good pictures. I went outside early that morning to get some local photos before the wind and warm sun removed the snow from the tree branches. I really didn’t need to hurry as the day never warmed up all that much and there were snow patches left the next day as well. The lenton roses are blooming as they do in the early Spring, but so far not much else is providing color other than green. It’s a good time of year to clean up the beds, before the black flies show up. So I cleared the back garden of stray blackberry briers that constantly try to invade my tiny garden space. And I removed the leaves that have been covering the dirt. Next I will order some garden loam to fill my fabric beds and get them ready for planting in about a month. I just hope the weather will eventually get nice and warm, and I suppose it will.